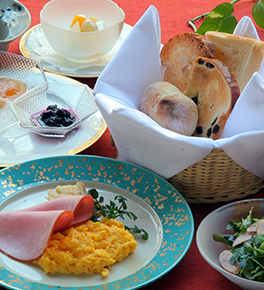 Enjoy breakfast and dinner in the richly designed restaurant while overlooking the garden. Take a seat in one of the comfortable seats of the hotel lobby with its high ceiling and enjoy views over the garden. Get refreshed after a relaxing hot spring bath with a cup of complimentary coffee and tea in the lounge. For those wanting to exercise, there is an indoor heated pool free for guests to use. The garden is a traditional Japanese one, with koi fishes in the stream and 100-year old sakura blossom trees. Art aficionado's will enjoy the exhibition in the lobby dedicated to paintings and calligraphy. 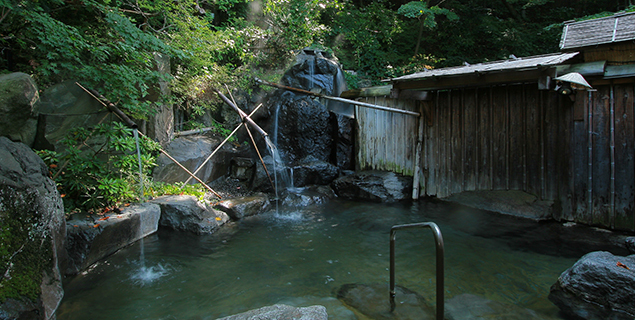 The hot springs of Senjukaku are famous in Nagano Prefecture for having the largest source of natural hot spring water. The hot springs are filled with a phenomenal amount of water at 720 liters per minute, 1,036 tons per day. The water of the communal and private hot springs is constantly drained so you are always sitting in a bath of fresh water. If you want to fully experience Japanese onsen culture but with just you and your selected group, Senjukaku’s private hot springs offer the solution. 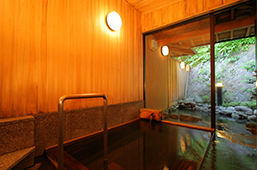 The private hot springs are equipped with both outdoor and indoor baths. 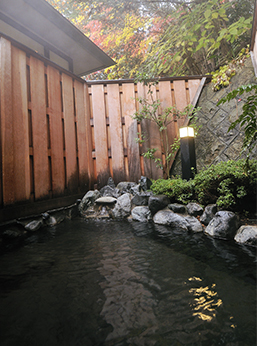 There are two types of private onsen at Senjukaku; the hinoki or Japanese cypress bath, or the granite bath. Shower also available. The outdoor section of the communal bath is relaxing to bathe in no matter the season. Take a seat and unwind while taking in the view of the lush green surroundings in spring and summer, the red and orange maple leaves in autumn, and the falling snow in winter. 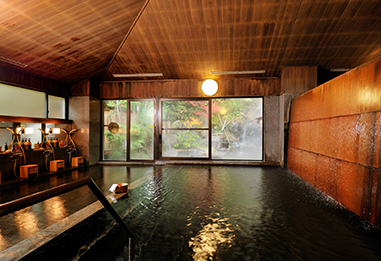 An enormous amount of hot water comes pouring down from the stone wall on into the indoor hot spring and overflows to the floor, creating a unique hot spring experience. The deluxe room has its own private outdoor onsen on the balcony. From the outdoor onsen, look out over the garden and the Five Peaks of the Northern Alps. The room is luxurious and spacious, with not only an outdoor hot spring, but also a granite indoor one. 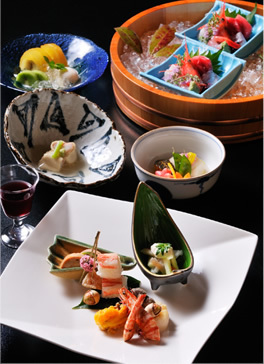 The pride and joy of Hotel Senjukaku is the food. Our Japanese traditional multi-course food (also called kaiseki) is all made by locally grown and seasonally available ingredients such as Shinshu beef, chicken, and vegetables like mushrooms. 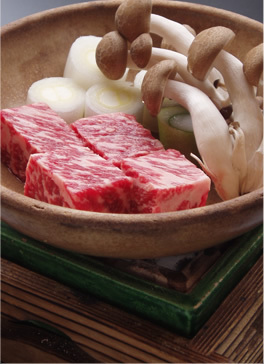 Shinshu beef especially is a local staple food. Since Nagano is the apple prefecture, Nagano cows are fed the locally grown apples. This gives the Japanese wagyu a unique taste. Another quality meat from Nagano is the Golden Gamefowl, a banded chicken that is raised according to strict standards to ensure its high quality. 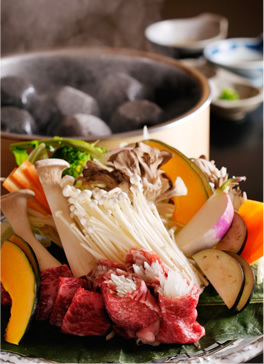 Nagano being one of the most mountainous prefectures in Japan is also home to many vegetables such as mushrooms, potatoes, legumes and more. 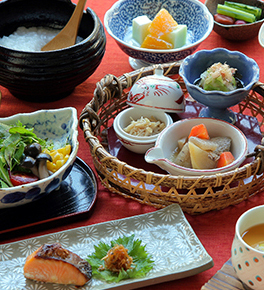 Senjukaku Hotel caters to visitors with various dietary restrictions like vegetarian, gluten free and more. Let us know your preferences at the time of reservations and we will make sure to have food prepared that suits to your needs.